What’s the most dangerous outdoor sport in Colorado? This question posed by a listener on Colorado Public Radio got me thinking about all the things I like to do outside. She specifically asked because her child wanted to learn downhill skiing, and stories of people dying after hitting a tree had her concerned. Interestingly, according to statistics, the chances of dying while skiing are slim — about 1 in 1 million. I have to admit, it’s not something I think a lot about while skiing. Mainly, I’m just exhilarated from the freedom of sliding down a hill surrounded by the beauty of nature. Although, back in the era when hardly anyone wore helmets, and I skied with a bunch of 22-year old guys who knew no bounds, the thought of getting injured did cross my mind. Becoming a ski bum at Mammoth Mountain in the 1990s right after college, we skied with abandon. At one point, as we flew down the mountain, catching “big air” off a jump, I thought – you know if I fell right now, it’s possible I could break my neck. I actually did fall a few times, but never injured myself seriously. However, the lack of a helmet back in those days did cost me. One last run down the mountainside, I caught an edge, my ski came off and whacked me in the head. As I skied to the bottom, I rubbed my head and found blood all over my hand. One lesson I’ve learned skiing for 30 years is you are most vulnerable for injury those last few runs. The legs are burning, you’re feeling taxed cardiovascularly. It’s not the time to tackle the black diamond bump run. So these days, I take the blue cruiser run to the bottom, and I’ve found I usually end the day without recourse. But what about the other sports that Coloradans love so much? Climbing, hiking, bicycling? Turns out that what seems like a rather innocuous activity – walking through the woods – can be the most dangerous. With a chance of death as one in 16,000, hiking is pretty dangerous. Probably because a lot of variables can turn what seems like an easy hike into a recipe for disaster. 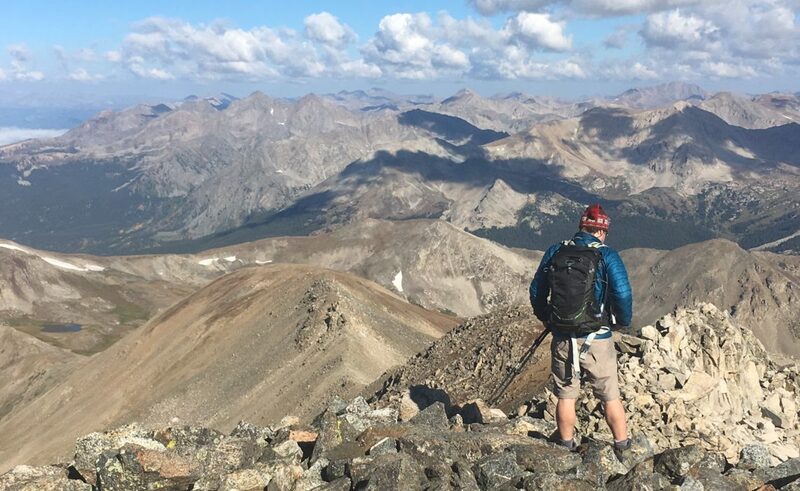 Bryon and I love to hike Fourteeners – Colorado’s 14,000-foot peaks. We often joke that we know if we had a heart attack while scaling these massive mountains, that would be it. There is no EMS that would get there fast enough to save us. But it’s a risk we take, because of the joy it gives us to stand on top of these grand peaks and feel as if we are on top of the world. You decide on a hike in the Indian Peaks on what seems like a Blubird day at 9 a.m. By 11 a.m., when you’ve reach above timberline, black clouds have formed overhead. Anxious to retreat to the safety of the woods, you start running down the trail, trip and fall, and potentially break your ankle. Suddenly, your easy hike to Blue Lake is turning into disaster. Add into this scenario a lack of extra food, water and clothes, and a potential unplanned night in the wilderness, and survival looks pretty challenging. I could see how the mom who asked this question could worry about the dangers for her young child. But the truth is, the benefits of exercise and connecting with nature far outweigh the potential dangers that could happen. And judgment and preparation go a long way towards insuring a safe experience while re-creating outdoors. By being prepared to spend the night outside, having a tracker device, taking extra clothes, food and water, you’ll probably insure that it will never happen. Watching the weather, and turning around early will keep you from becoming a story in tomorrow’s newspaper. Ending your ski day before your legs are too tired to make good turns allows you to ski another day. Recreating in this beautiful state is what makes it great to live here. We just need to be smart about it. Poo in the Air = Snow?